Why is it Kansas City jazz clubs seem to thrive under former brothels? When the building which today houses The Majestic was built in 1911, the first floor was a saloon and the top two floors a brothel. The lower level, where the jazz club now resides, was a Prohibition-era speakeasy. And the 1888 building which today houses The Phoenix once featured a first floor saloon and second and third floor brothels. 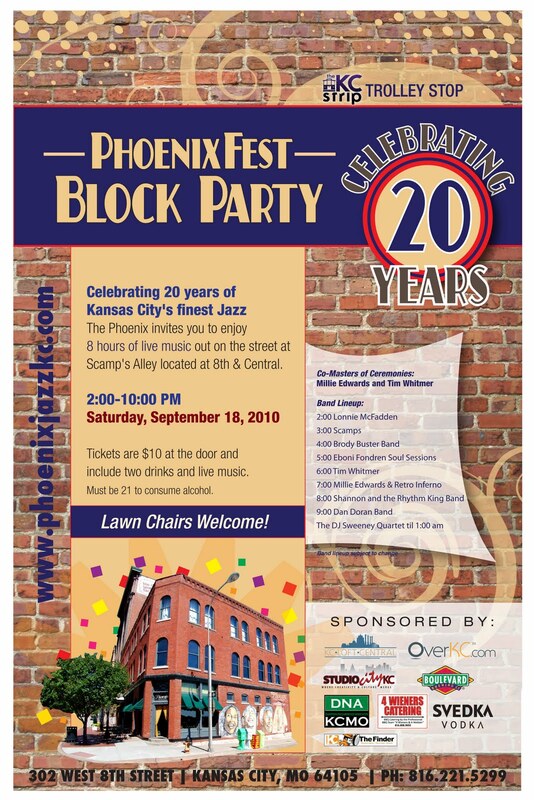 The Phoenix is getting ready to celebrate 20 years as a jazz club beneath those one-time brothel floors. On Saturday, September 18th, from 2 to 10 p.m., they’re throwing a street party with bands, drinks and food. They suggest you bring a lawn chair. More details are on the poster at the left (a larger and more legible version of which should open if you click on the image). 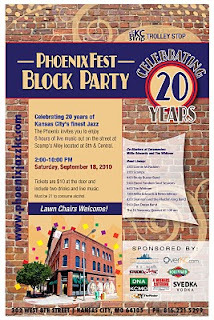 The week prior, on Saturday, September 11th, I’ll be taking that lounge chair to Harmon Park at 7700 Mission Road for the first Prairie Village Jazz Festival. I know no more about it than what’s on their web site, here. But that lineup, headlining Eldar Djangirov and Karrin Allyson with the Kansas City Jazz Orchestra, looks stellar.